Nakamichi NTX 305Power AmplfierFeatures:Adoption of small loop negative feedback technique eliminates transient intermodulation distortionDesign of common emitter common base circuit makes the frequency band of amplifier wider and more balanced,low-frequency thick and elastic,medium frequency smooth..
Yamaha XP7000 Power AmplifierYamaha XP 7000 Power Amps offers five power amplifier models that deliver unmatched quality and value for installations. 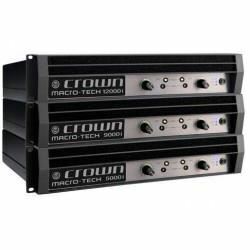 These power amplifier feature high power, outstanding sound quality, extended reliability, and superior stability for a wide range of installed sound ..
Crown Audio XLi 3500 Professional Power AmplifiersThe XLI Series of power amplifiers from Crown® represents a new era in affordable, quality power amplification. All four models in the series are powerful, rugged and reliable. They are suited for musicians, DJs, and entertainers as well as houses of..
Power Amp Peavey CS4000 1,350 WattBuilding on the reputation of the world-famous Peavey CS 800, which conquered the power amp market in the 1970s, the CS Series is the global standard bearer for workhorse reliability. Over the years, these amps have benefited from some of Peavey's most popular audio..
Powerart PA800 Power AmplifierPower Amplifier keluaran brand Powerart dengan daya 800W di 8 ohm--------------------------------------------------Power Amplifier Powerart PA800Power Amplifier from Powerart with 800W power at 8 ohm..
Yamaha P3500S Power AmpliferYamaha's audio engineers have specifically designed the new P-Series power amplifiers to be perfect companions to the popular Club Series loudspeakers. To achieve this, they made sure that the amplifiers are capable of delivering power that matches the power handlin..
QSC RMX 5050 Two-Channel Power AmplifierProfessional quality performance, incorporating road-proven QSC designsFeaturesCompact size — up to 2500 watts in two rack spaces, or 5000 watts in three rack spacesHigh-current toroidal transformers, for greater 2-ohm power and low noiseIndependent user-defea..
Yamaha P2500S Power AmpsYamaha audio engineers have specifically designed the new P-Series power amplifiers to be perfect companions to the popular Club Series loudspeakers. To achieve this, they made sure that the amplifiers are capable of delivering power that matches the power handling capabiliti..
TOA ZA-2030 AmplifierModel: ZA-2030 Power Source: 220-240V AC (H version) or 24-30V DC Rated Output: 30W Power Consumption: 78 W (AC operation at rated output). 34 W (at 1/8 Power). 2A (DC operation at rated output). Frequency Response: 50 - 20.000 Hz (+3 dB) Distortion: Under 1% at 1kHz, ..
Mackie FRS-2800 - 2800 Watt 2-channel Lightweight Power AmplifierThe Mackie FRS 2800 is a power amplifier that gives you amazing power, price and portability—for the real world. The FRS 2800 power amp features Mackie's legendary Fast Recovery™ circuitry for clean, undistorted sound with the ultimate..
QSC RMX 850 - Power AmplifierThe RMXa Series amplifiers from QSC offer true professional-quality performance at an affordable price. The 2-rackspace model RMX850a features output power of 185 watts per channel at 8 ohms. It has a compact chassis less than 16" deep. RMXa amplifiers include a comprehe..